Students are coming to your classroom each night internally asking a lot of questions. Questions like: What is important for me? What are my immediate needs? What will be my future needs? Which call do I answer (passion)? How do I do good (purpose)? How do I engage in personal development? What is the right trajectory for me? What are my personal goals? One of the ways we can begin to address their questions is to develop a strong culture on our campuses. A Harvard Study discovered that building a strong culture increases success by 765 percent over a ten year period. Daniel Coyle in The Culture Code stated, “Real power of the interaction is located in two-way emotional signaling. It creates an atmosphere of connections that surrounds the conversations.” Dr. Rick Upchurch sums this idea up in stating “all of life boils down to relationships.” To accomplish these connections and conversations, we have to be intentional. We have to allow students to become emotionally invested to spark a personal desire to change habits. Dr. Mark Kay Park illustrated this with an account of what became the Community Led Total Sanitation Program in Bangladesh. The leaders had provided villages with new stainless latrines, but the inhabitants were not using them. CLTS realized that they need to spark a desire in the culture to change habits. The needed what they called an “ignition moment” to allow the community to take responsibility. To accomplish this they needed every member of the community to become emotionally invested in the goal. The send sent facilitators into each of the villages who had members of the community draw a map on the dirt ground. They then had them use yellow chalk dust to mark on the map the communal defecation area. They asked them where they defecated when it was inconvenient to go to the communal area, when they could not make it to the area, or when they were simply ill. Eventually the entire map was covered with yellow dust. They asked the villagers if they had ever seen flies in the communal area and if flies had ever landed on their food. They helped them to make the connection between flies spreading disease and members of the community contracting disease. The villagers emotional response to being the ones responsible for the spreading of disease in the community motivated them to follow sanitary procedures and utilized the latrines. It was their “ignition moment” to work for change. No new information was presented, yet it changed their behavior because it connected to their emotions. The same idea can help our students persevere to the end. What will their “ignition moment” be? How will you introduce it to them? We need to think about problems that no one want to discuss and to help others see the truth. 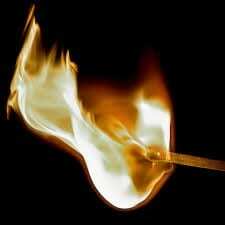 That “ignition moment” may not only the change the trajectory of their life and career, it may also change their family’s legacy. The most powerful change happens when our students discover the truth for themselves. Magical moments like these can change a student’s personal perspective. To provide these “peak” – “ignition” – “magical moments,” we will need to cultivate a strong culture in our classrooms. Three basic actions that we can take to cultivate this kind of culture are to build safety, share vulnerability, and establish purpose. A safe community allows academic freedom to discuss these hard issues balanced by the Christian Worldview and this will generate bonds of belonging. Those who share vulnerability bump up performance by 24% and this explains how the habits of mutual risk together drive trusting cooperation. Finally, establishing purpose within the classroom drives everyone to go in the same direction together. This can be engendered in the classroom by encapsulating purpose into stories that drive shared values and shared goals. It is appropriate to be motivational in the classroom and to share inspirational stories. Be encouraging. Dr. Park closed the 2018 CAHEA Conference with two insightful Illustrations. The first was about Dr. Alfred Tomatis who developed the Tomatis Method. He was an Ear, Nose, and Throat doctor whose theory stated that many vocal problems were really hearing problems. An opera singer came to him who had lost their voice. He did not believe that it was a vocal cord issue. He performed a different kind of check-up and discovered that inside the opera singer’s skull, the ears were experiencing 140 decibel sound – louder than a military fighter jet – and that the singer was being deafened by his own voice. He theorized on the reason for selective deafness and selective muteness – the voice can only produce what the ear can hear. The second illustration was about Krakatoa – a volcano that erupted in the Indonesian Island Arc. In 1883, rancher in Australia heard the boom some 2800 miles away. The volcanic island erupted at 310 decibels and caused 120 feet tall tidal waves. It was felt around the world, even in the opposite point of the world, Colombia, South America. Dr. Mason then went over the results of the assessments for each of the business programs. He discussed course modifications and strategies for improving the scores. Overall he expressed satisfaction with the programs in general, although he noted a few areas which need attention, specifically related to quantitative courses in the BBA and MBA programs. Sadly, the recording of the webinar stopped after 8 minutes so I cannot link it here. If you have any questions related to the webinar or specific assessments, please contact Dr. Mason. A student walks into the classroom after working all day, comes straight to class where she will be for the next four hours before getting home around 11:00, if she’s lucky. Hopefully her children have had a smooth evening and are asleep, otherwise it will be a really late night. Then back up to get everyone off to school and head back to work. Week after week, month after month, usually for two, three or four straight years. Why, because this her route to a better life for her and her family. She doesn’t just want the degree, she needs the options it will bring for herself and her children. Belhaven University provides the opportunity, the path toward that better life. The focus on a Christian Worldview which permeates the curriculum gives her more than she bargained for and its value will multiply back to her over the years. BU and the focus on a Christian Worldview will leave a mark, but it is the Faculty who make it work. It is the Faculty who bring themselves to the intersection of these students striving to better themselves and the course content. It is the Faculty whose passion, faith, compassion, and knowledge make it possible for the student to be willing to persevere. It is the Faculty who perceive their role as mentors and guides whose comments and personal discussions inspire and encourage. It is the Faculty who see more than a paycheck; who see mission and purpose in changing lives as a calling that pass along more than the curriculum contains. You are why it works. Thank you. 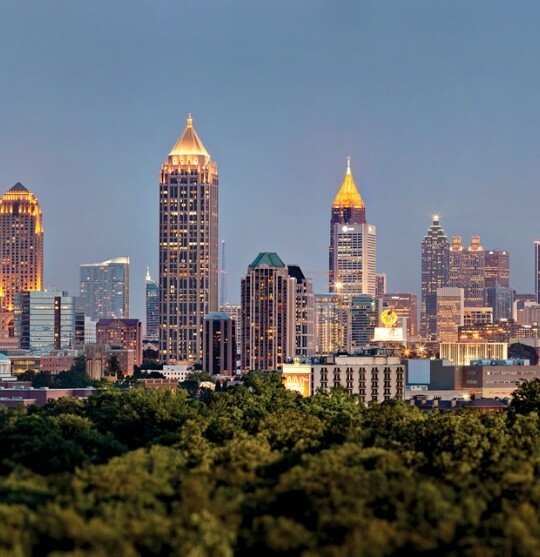 As the new Dean of Faculty at Belhaven Atlanta, I have found it necessary to review critical leadership practices to not only provide a renewed sense of direction, but to excite critical directives that produce sound results to ignite extraordinary possibilities. I have found Kouzes and Posner’s (1995) Five Practices of Exemplary Leadership to be the catalyst to do just that. Kouzes and Posner introduce Five Practices of Exemplary Leadership which have proven life changing: Inspiring a Shared Vision, Challenging the Process, Encouraging the Heart, Enabling Others to Act, and Modeling the Way. Many have tried to choose the practice they deem most viable to the success of the organization. Consequently, I believe one cannot survive without the other. Each practice is unique in that it serves as a connector to the other and further yields results of trust, integrity, moral aptitude, a “can do” attitude, and empowerment. However, none of which is more important than the other. Rather, each compliments as a necessity to the other for effective leadership to occur. Effective leadership is a buzz phrase that should not be taken lightly. While everyone has the ability to lead, not everyone approaches the responsibility with purposed commitment. That commitment is usually the difference between being a good leader and being a great leader. What is the differentiator between the two? The deciding factor is understanding that our positions often equip us with breaking lives or changing lives. It is my continued goal to exercise the latter both in and outside of the University. “The empirical literature in leadership has shown that transformational leadership is where leaders and followers raise one another to higher levels of motivation and morality” (Burns, 1978, p. 20). As leaders, we know it is not always an easy task to exercise each practice. Some days we just will not feel like it. It is during these times that it becomes necessary to do so anyway. Such days prove to be our discipleship test. In doing so, let us model the way of Paul and Silas, and pray anyway. Even in prison, they praised. It is necessary to understand that we are blessed to be a blessing to others. The Five Practices of Exemplary Leadership are cyclic in that they are transferable to academic, personal and professional lives. Therefore, we are afforded countless opportunities to master the practices in order to effortlessly and purposely execute them. I implore each of us to continue to focus on the totality of these practices in efforts to foster life changing growth as leaders and to gain a “level of commitment, engagement, and satisfaction of those that follow.” It will not always be easy, but our walk is not designed to be. By now many of you have had to interact with the new Blazenet and I thought I would take a few minutes in this post and give a short tour of the more important, relatively speaking, aspects of Blazenet for Faculty. First, Blazenet is no longer the repository for Faculty Modules of the curriculum used in either our on-site or online courses. These modules can now be found in a Faculty Module Library in Canvas. The student modules are also no longer available on Blazenet and can be found on the Canvas course-site. This is a big improvement regarding keeping the modules lined up with each other and with the Canvas build-out for the course. You should automatically enrolled in the Faculty Module Library if you are scheduled to teach a course but if for some reason you don’t have access or can’t find it, contact your Dean. Second, recording attendance in Blazenet is both the same AND different. Before attendance can be posted the first time the course has to have the gradebook set-up. There are help videos for this which I will mention later in this post. 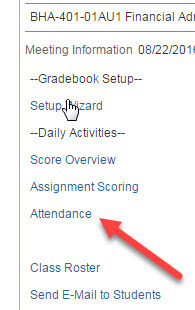 Once the grade book is set up, posting attendance is relatively si mple: from the home page, click on “Self-Service” drop down and choose the options which gets you to “Faculty Information.” From there click on either Class Roster or Grading and select the appropriate course. Click on the link for Grade book and it should take you to a screen with information like in the picture on the left. Click on Attendance and the appropriate date to record attendance. Note that dates only show up as they arrive on the calendar. Third, you can email one or more students from the same place you mark attendance. Instead of clicking on Attendance choose the “Send E-Mail to Students” link. This is helpful for keeping all communication with a student in a tracked repository in case there are any questions that arise later, e.g. grading. Fourth, this is also where you will come to post your final grades for the course so you can be paid. Fifth, from the menu select Faculty Homepage and you will find helpful Quick Links and, more importantly, How-To videos under the FAQ section. Simply click on the appropriate question to discover short tutorials which answer the question. Sixth, from the menu select Faculty Resources/Adult and Graduate to be taken to a page with a variety of resources designed to assist you. QuickLinks, FAQs, contact information for the respective Deans, and Forms & Documents which includes the most recent Adult Studies Faculty Handbook September 2016. If there is more information you would like to see available on Blazenet, be sure to let me know at rupchurch@belhaven.edu. The article below comes from Educational Technology and Mobile Learning. They do an great job on providing information to educators about technology that will enhance the classroom experience, as well as ideas about how to use technology more effectively for teaching. This particular article deals with Google forms. You may remember this being touched on in one of our webinars: Google Docs in the Classroom. Google forms is a powerful application for conducting polls, gathering information, etc. I think if you take the time to read through this guide a lot of ideas about how you can use it will come to mind. Although this is a separate article from Educational Technology, it bears on the above in that it shows you how to set up forms so that you can be notified when students submit responses to the form(s) you have created. I have to say the students’ response surprised me because it says that some faculty have employed the practice of dismissing students earlier than 10pm and then staying on to 10pm themselves doing one thing or another before leaving. We have hundreds of excellent Instructors who ARE holding their classes to the full time. I want to thank you for that and commend you for your diligence and integrity. I’m hoping this is a rare occurrence, but I need to make sure there is no ambiguity on this point. The truth is that we are attempting to establish a culture of ethical practices and excellency, neither of which are achieved by allowing students to leave early but staying ourselves until the full time. This not only lessens the educational experience but it says to the student that “fudging” on the policies of their organization must be OK if it is OK for a Christian Instructor in a Christian Institution to do so. YOU ARE A MODEL IN EVERY ASPECT OF YOUR CONTACT WITH STUDENTS, DO THE RIGHT THING!!! Or, to put it in simple terms, no, you can’t let students go earlier than 10:00pm even if you stay the full time. Dr. Ruddell, Dean in Houston wrote a great post on Taming the 10PM Titian which I encourage you to read. I know also there are a variety of posts within this blog under the Category “Collaborative Teaching Ideas” which could be used quite effectively to fill that last hour if you are running low on ideas. This also goes back to the Collaborative Learning Strategy which I’ve written on before. You know things will slow down after 9:00pm, so plan some more energetic activities during that time.